It’s the holiday season. You’re probably already looking at gift ideas for family and friends. But how are you doing it? Increasingly, you’re probably using your phone. And you’re not alone. Criteo’s Q3 Global Commerce Review found that there was a 9% increase in transactions from mobile devices since Q3 2016. During Cyber Monday 2017, nearly half (44%) of all purchases occurred through a mobile device. Mobile purchases happen anywhere. Shoppers research products at the dining room table. They compare during their lunch break or in line at a coffee shop. Maybe they show friends what they’re thinking about buying, too. Along with video demos, YouTube testimonials, chatbots, 360-degree photography, and augmented reality, mobile commerce isn’t blurring the line between the retail and ecommerce experience – it’s eliminating it. At the same time, ecommerce companies are putting a new emphasis on the physical. Starbucks closed the company’s online store in favor of in-store interactions. Ecommerce startups are filling retail spaces to build in-store locations and pop-up shops. During Black Friday weekend, a higher-than-expected 174 million shoppers flocked to brick-and-mortar stores. While companies have continued to focus on ecommerce and retail business as separate experiences, shoppers no longer make a distinction. And that’s why, as we look forward to 2018, it’s time to drop the ‘e’ in ecommerce once and for all. This holiday season especially proves that the age of commerce marketing has begun. If you ask the average shopper how they want to buy, Criteo’s Shopper Story 2017 found that 69% say that they prefer to shop online. But 72% like to try new retail stores and 74% enjoy shopping in physical stores when they have the time. Basically, shoppers like to buy how they like to buy. Rather than trying to incentivize shoppers to buy online or buy offline, businesses need to instead focus on experiences that span both online and offline. That’s where a commerce marketing strategy bridges the gap. A commerce marketing strategy has three fundamental parts: connect, build, and measure. Connect Your Online & Offline Experiences. Do you know if your offline shopper starts evaluating a product in-store and finishes the journey online? Or vice versa? Closing the loop can help boost sales and re-engage shoppers who didn’t complete the purchase. Omnishopping is the new normal for shoppers and marketers have to think about the behavior most common to their audience. By connecting online and offline experiences, a commerce marketing strategy focuses on turning foot traffic into web traffic and vice versa. Evaluate how shoppers in the store can be identified and contacted in the future. Something as simple as an email list – with an incentive to sign up and great content in each email – can do wonders in building loyalty and long-lasting customer relationships. Retailers should focus on offering experiences in stores that can’t be replicated online, too. Eyeglasses provider Warby Parker, for example, started building retail stores that offer puppy parties, author readings, and other events that attract foot traffic and build brand affinity. On average, nearly 7 out of 10 shoppers fill out a cart and don’t make a purchase. If businesses can figure out how to lower the shopping cart abandonment rate – even by a few percentage points – it can make a huge difference for the bottom line. Omnishoppers are faced with an infinite array of options, whatever the channel or device. The only way to stay top-of-mind is to provide relevant content at each of these touchpoints. And that means leveraging shopper data in new ways. Data management strategy is a priority for marketing execs already. In Criteo’s research with Forbes Insights, we found that 4 out of 5 brands and retailers use customer data as part of the business strategy. But there’s real concern about tech giants like Amazon and Facebook limiting access to customer data. If you’re trying to connect with your audience but have to go through a third party, the third party is the one that ultimately controls the customer relationship. In an effective commerce marketing strategy, companies pool data assets to gain a competitive advantage. Our research showed that three-fifths of brands and retailers are doing this already. Data collaboration initiatives help expand ad reach and ad relevance, while helping smaller brands and retailers compete against the bigger challengers. If you’ve been running social media campaigns for a while, you’ve probably drilled down into the metrics and analyzed what they mean for the business. And, if you’re like most marketers, you might be measuring vanity metrics like engagement, impressions, and video views. Social media marketing has been a fundamental tactic for businesses for more than five years. But all the research shows that ROI is still difficult to prove – in 2017, more than 60% of marketers surveyed said that proving social media ROI was their biggest challenge. In the US, only 1 in five CMOs can demonstrate the impact of social media quantitatively. Content marketing is another difficult tactic to match to ROI. In a survey from TrackMaven, 71% of respondents said that attributing social and content marketing to revenue was their top challenge. Social media and content marketing strategies are usually measured by consumption. Your commerce marketing strategy focuses on one thing: sales. Did your commerce marketing campaign lead to conversion? What kind of sales did you see? By tracking the shopper journey across touchpoints – right down to the sale – commerce marketing offers the straightforward ROI of a product page to every channel. Want to get started with your commerce marketing strategy? Drop the ‘e’ in ecommerce. Start personalizing for the shopper, not for the channel. A commerce marketing strategy acknowledges the changes across shopper behavior and helps organizations adapt to the realities of the new physical-digital world. 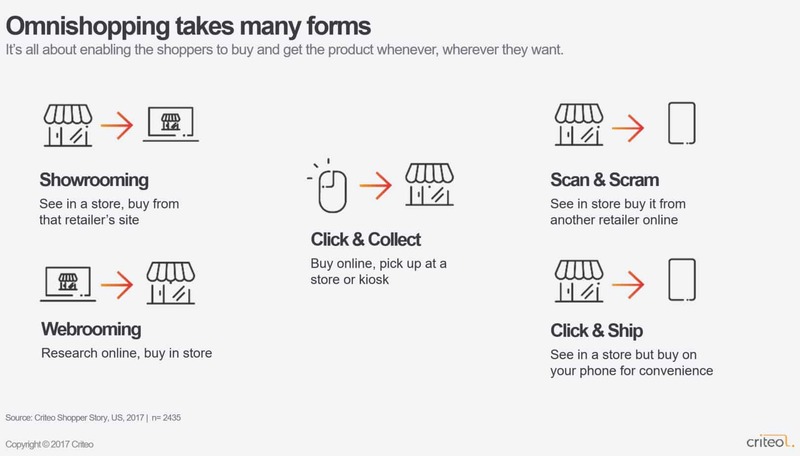 By focusing on the holistic shopper experience, teams can connect the online and offline experience in new ways, build lasting relationships with shoppers, and measure success every step of the way.